Apparently five essays in January was one essay too many. It’s 1/4 of the way through February and I haven’t written any of these reviews. I’m going to do them now and I’m going to make them short. I got this because I loved the writing in the author’s Tiger Lily and I wanted to see if this had similar writing. Alas it did not. It was a solid good female friendship book, but not much else to write home about. Interesting. I think I will never do anything she does in this book, but I was curious to see how she transformed things. I don’t so much read novels by Michael Chabon as I immerse myself in words. His novels are made up of a lot of words and this one is no different. There were so many words, I couldn’t finish them all in a three-week period and had to return the book and request it again. If you don’t mind immersing yourself in words, this book is a joy to read. It’s full of interesting characters of many different generations, set in an interesting place and comes complete with an interesting plot. I wanted to like this book, but the whole thing felt rather padded. There were all sorts of digressions which were kind of interesting, but not really. I probably would have eventually ambled to the end of the book, but it was called back to the library. I attended the Multnomah County Library’s Printz Workshop for the third year in a row. Our job: read 10 YA novels, get together and discuss and vote one novel the winner. Above you see my top three choices. The 2013 winners? Click here. Note that one of our choices was an honor book. None of the rest of the winners were on our list. Essay: It turns out I have very strong feelings about the movie the Notebook. Be aware! This here essay is rife with spoilers. 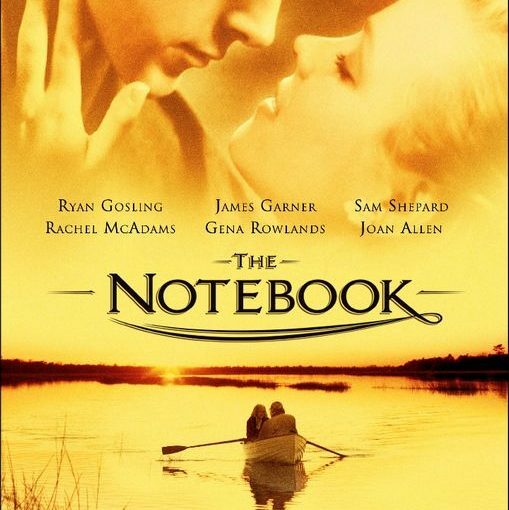 So if you want to keep the plot of the Notebook undiscovered, stop reading. But if you have seen it, or you plan on never seeing it, read on to discover why this is not a sweet, romantic film, it is C-R-E-E-P-Y! Let’s look at the first meeting of Noah and Allie. Noah, (Ryan Gosling) asks who this Allie (Rachel McAdams) is and his friend Finn explains. Then, despite the fact that she walks up to him with not one but two guys on her arm, Noah leads by saying, “Do you want to dance?” Note that they are not at a dance, they are at a fair. There may be a dance at the fair, but there is no dance in the frame of the camera. Allie, quite rightly, says no and flounces off to ride the Ferris Wheel. What an awkward beginning for Noah. I’m willing to give him a pass because maybe he’s nervous or so overcome by Allie’s beauty he makes an awkward move. Who hasn’t done that? But then Noah leaps onto the Ferris Wheel, landing in the same car as Allie and another man. If this happened to you, would it be romantic? No, it would be super creepy. Even if the person who did it looked like Ryan Gosling (who I do not find attractive at all because I think he looks like a hamster, but I am aware that many women don’t see his hamster qualities, and instead find him rather dreamy). You would not be attracted to this weird man because you don’t know this person and also invading space like that is wrong, there’s a reason we each have our own bubble. Plus, there’s a weight limit on those Ferris Wheel cars, what if they crashed to the ground? okay? Is the potential date’s need not just for the date but for a loud proclamation of the desire to date the man in question okay? I hope you have come to the same conclusion as me, but just in case, I will say it straight: no it is not okay, it is rather disturbing. Moving right along. Noah remains persistent about the coerced outing and eventually they go out together. So here’s a guy on a date with a woman he is very into. He is so into her, he risked life and limb, et cetera. What does this guy who is crazy about this woman do on the very first date he takes her on? He says, “You know what your problem is?” and then tells her what he thinks her problem is. Gentlemen. On what date is it okay to begin pronouncing your view of the flaws of your date? Ah! Trick question. It’s not okay on any date. If your date needs to deliver a diagnosis of your supposed flaws, then this person is not the person for you and the date should end. It is never romantic to say, “do you know what your problem is?” because, really, who are you to say? So then there’s a bunch of shoddy tell-don’t-show film making wherein we find out that Allie and Noah were crazy about each other and they fought all the time. Again, there isn’t enough character development to find out why they fight all the time and why exactly they are so into each other, but I can say that if you are mostly fighting with the person you supposedly love, it’s probably not so much love and you should probably part ways and find someone you don’t fight with. Then, there is a cruel parting and Allie is whisked away by her parents (who, as far as I was concerned, were right on the money) and Noah writes one letter per day to Allie for an entire year and she never writes back. We know that Allie’s mother is intercepting the letters and she doesn’t know about them. I want to go on record as saying this is wrong of Allie’s mother and I don’t condone it. However, after a year, Noah does the healthiest thing he does in the entire movie and moves on. Or, at least, he stops writing to her. beard during all the big reunion scenes? No ma’am, it did not work for me. Someone who completely restores a house, and works obsessively (a word the film actually uses) to renovate it the way someone said once, five years ago. Is that someone capital-R Romantic? Or big-C-stay-away-from-me CREEPY? I think we know the answer. Think of someone you haven’t been in contact with for a while. Say you run into them, go for coffee, and you find out that they had built a shrine to you in their backyard. That’s the moment when you fake an emergency call and leave the coffee shop. So that’s all Noah and Allie back in the day. And that’s bad enough. But interspersed with the supposedly tragic story of the lovers is the present-day story of a sweet old couple who we later find out are Ryan and Allie. And when I say present-day, I mean the 80s or 90s or some such thing, it was hard to tell from the clothing. Present-day Allie (Gena Rowlands) has dementia and present-day Noah (James Garner, a man much more substantial than hamster Gosling,) has moved into the care facility where Allie lives so he can read from the notebook where Allie wrote their story, the same notebook that gives us the title of the movie. As the movie progresses, we see Noah tell their story to an uncomprehending Allie, ignoring the advice of a doctor and insisting that the story always brings Allie back to him. In fact, Allie has even written in the front of the notebook that he should do this. So he spends the day reading the story to her so she will return. And she does “come back” and they have a dance and catch up on the news and this is all so very sweet. It lasts for five minutes and then Allie forgets again and completely freaks out and has to be held down and sedated. minutes of recognition followed by the potent drug cocktail. It’s completely worth it. have said they think this is sweet and maybe if I hadn’t just watched 122 minutes of creepy behavior it would be sweet, but, alas, I had watched 122 minutes of obsession and that puts dying together into that same “ew” category. So, dear reader, I implore you to continue watching this movie if you find it lovely and romantic. But if you find yourself in this same situation in real life? You might want to check the creepy meter. It’s probably running pretty high. 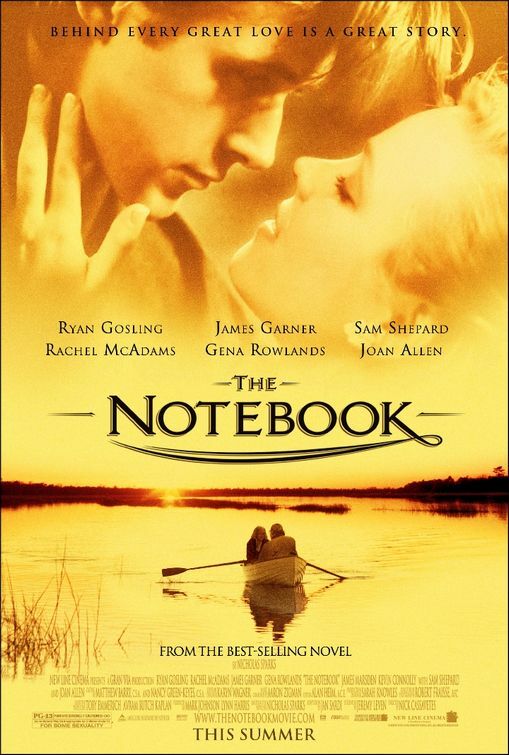 Posted on January 24, 2013 November 19, 2016 Categories All (-ish), WritingTags essay9 Comments on Essay: It turns out I have very strong feelings about the movie the Notebook. I hadn’t seen this movie, a favorite movie of many fans of the romance genre, and I wondered why. I like both the actors (Rachael McAdams is A-okay in my book, and I like Ryan Gosling just fine) and since I liked Dear John much more than I thought I would and this movie is also based on a Nicholas Sparks book, why not? Well, it turns out I was not a fan, so much so that I wrote 1500 words on why this movie is not romantic, it is creepy. The ceiling of the first floor is creeping toward us. On second viewing (I brought the boyfriend along this time; he liked it) I can say that I really enjoyed the speeches by Jennifer Lawrence’s character when I could tell she’d been through a lot of therapy: “Let’s talk about that…” I also enjoyed how clearly and succinctly the family dynamics came through. This held up quite well through a second viewing and I can still recommend it. Where watched: Regal City Center 12. Cost: Free, thanks to passes. *Please note that there was excellent acting by Sally Field, but she is twenty years too old (I looked it up) to be Mary Todd Lincoln and that was incredibly distracting from the overall whole of the movie and her performance in specific. There is no way that Sally Field looks like the mother of Tad Lincoln who was 12 at the time of the movie. *** Also please note that seemingly every male character actor in Hollywood is in this movie and thus it was very hard for me to pay attention as I was constantly trying to figure out where I had seen that fellow before. **Check back in 15 years, I suspect this film won’t age well. ***Here’s a picture of Mary Todd Lincoln in her inaugural ball gown. The information with the photo doesn’t say from which inauguration. She’s no spring chicken, but she’s no old crone, either. What 40-something actress would have been an age appropriate choice to play Mrs. Lincoln? On Monday, the Oregonian ran a commentary* by Peter Laufer, in which he attempts to convince the reader to join the “slow news” movement. Mr. Laufer, I am happy to say I am already a member, as evidenced by the fact I read your column on Wednesday, two days after it was published. I already have stepped off the 24-hour news cycle, having realized that there just isn’t enough news for all 24 hours of the day. I read the paper daily—though I don’t always finish the current day’s paper by the end of the current day—I listen to NPR while cooking dinner and that is it. ** I will, on occasion, poke about online for more information about a current event, but mostly I just keep informed as people did in the last century: by reading the newspaper and listening to the radio. I read the paper; also the aforementioned cooking dinner hour with NPR. Unless some national tragedy is occurring, I can wait to wade into the details. most days there was no new news and given that few non-governmental events occurring in our nation’s capital are local it was a colossal waste of time. everything we “knew” about Columbine after the shootings was not accurate. I’d like to invite all of you to join me in the slow news movement. We can be informed, even if we check in at limited, regular intervals. *If you want to read the original column, it is titled “It’s OK to read yesterday’s news tomorrow.” and is available, for a time, by clicking here. **If I had more time, I would also read a weekly news magazine and also renew my subscription to Harpers and the Atlantic Monthly. If I had more time and cable, I would watch the Daily Show and the Cobert Report. This is one of those products I feel people go looking for. They buy a smart phone, they realize they can’t use it with their gloves on, they consult their friends or the Internet for a solution, et voila, they find themselves in the glove section of Macy’s staring at the selection. Or, they knew this product existed like I did, because the fluffy sections of the newspaper, as well as women’s magazines, explained the whole concept to me in the form of a “feature.” Advertising as news. Gotta love it. But yes, I’m always happy for more details. Unless the details are an obvious drawing that gives me no new information.